For the past couple of months, I felt like I was at rock bottom, and we're talking HARD gravel. I had to return to physical therapy for my back (I have two herniated discs! ), I was working 16-hour days at the computer, stress was at its peak and 45 was driving me to drink. It was really good timing (thanks, Universe!) when I checked into Ananda Spa retreat in the Himalayas for holistic realignment and meditating for a week. It truly was a transformative experience that I needed at a point I thought my soul had died. One night, I went down to the village of Rishikesh, right along the river. It has long been a place to unwind, relax and, most specifically, tap into your spiritual side. Allegedly, yoga was birthed here, and the destination has since become a soulful, holistic-minded place where travelers the world over come to retune themselves. The beautiful colors of Rishikesh. The Beatles famously came to Rishikesh in the late sixties to meditate, which put Rishikesh on the map on a global scale but also influenced their later albums. Everyone knows their music went from fun rock to a more meditated, deep sound that revolved around peace and love. I'm not surprised they chose to come here. Rishikesh is somewhat secluded, so travelers can tap into their inner EVERYTHING in an effortless way. It's also an authentic village town where the skies are clear, the good energy is felt everywhere and it's far from the maddening crowds. Even before The Beatles made it famous, yogic-minded Indians would become yogis or meditation masters here, and it's a stomping ground for those who have a good amount of spirituality in their lives (to put it in a more modern way, HIPPIES). 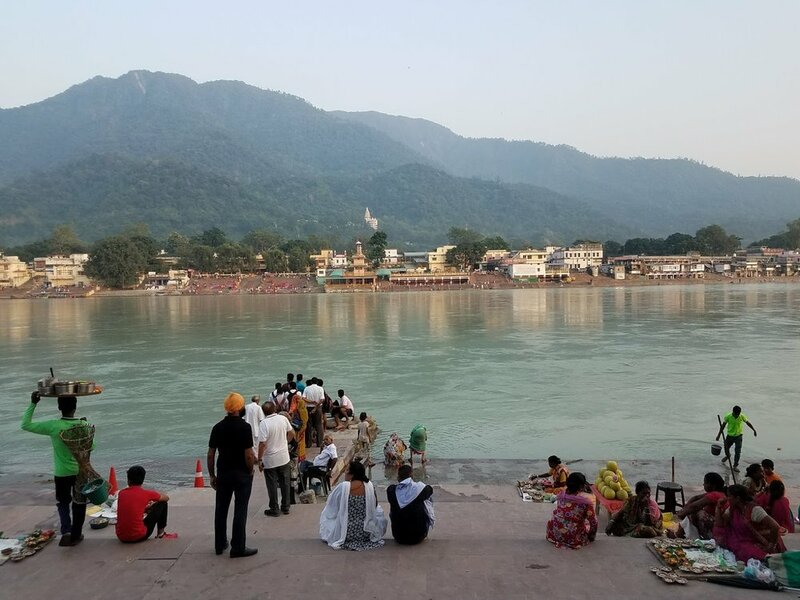 Rishikesh sees a steady stream of travelers, but I was told there was much more foot traffic because the world has been so insane the past few months (hurricanes, floods, earthquakes, 45), which has brought negative energy and raised stress levels around the globe. People are visiting Rishikesh to get back to a good place spiritually and mentally, and it's why I came after months of distress. Most travelers attend yoga and meditation retreats (which Rishikesh is famous for), which is highly recommended all things considered. If you're just passing through, you have to make a point to stay for sunset. Every night along the river, there's Ganga Aarti, which is a gathering of locals and travelers alike, who sing and celebrate life at sunset. I've never experienced so much joy in my life as hundreds of people congregated to feel the love and put good energy out into the world. Here's a video I took to give you an idea of what happens. The whole experience was uplifting, and I believe I left feeling inspired, seeing the good and realizing life is too short. I'm sure the more people have things gatherings and put good energy out there across the world, the energy levels will reach a good state in an enormous way. I've always believed this, but Ganga Aarti definitely reminded me how possible it is. Happy travels!